by Steven L. Brown. Brazos Press, 2007. The author of this highly readable e-book guides readers through issues impacting our medical choices, using viewpoints of both doctors and patients. Areas included are: strengths and weaknesses of medicine with focus on doctor as partner, progress in medicine including impact of bias and influence, issues around alternative medicine, and emotional aspects of illness. There is also a section of “Frequently Asked Questions.” While the book is written from a Christian worldview, the basic information is beneficial for readers of all faiths. 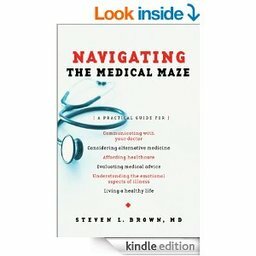 Steven Brown is Clinical Associate Professor of Internal Medicine at Texas Tech University and a cardiologist with private practice in Midland, Texas. He writes and speaks extensively on health issues in a variety of settings.